Snapshot taken by Heinrich (Henry) Ioganowitsch Arnowitz. He was born in Riga, Livonia, Russia. He took the pictures during 1917 on a WW1 convoy from Halifax to Great Britain when the ship sailed under the name "Dwinsk". They had on board soldiers of the Polish Legion. At that time the Dwinsk sailed under Cunard management and all the gun crews were British, apparently since the British Admiralty did not trust the Russian sailors after the Revolution. 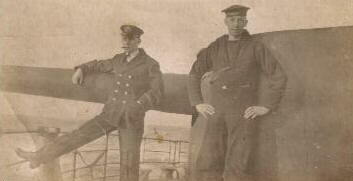 Snapshot taken by Heinrich (Henry) Ioganowitsch Arnowitz during 1917 on a convoy from Halifax to Great Britain. The soldiers are having some sort of lifeboat drill. 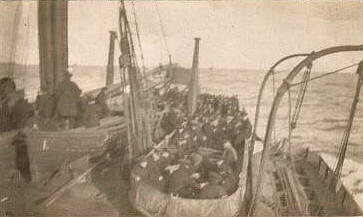 It was a lifeboat like the ones seen on this picture that disappeared with 22 men after the sinking in 1918. 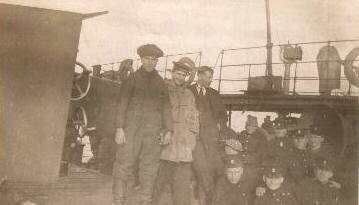 Snapshot taken with Heinrich (Henry) Ioganowitsch Arnowitz's camera during 1917 on a convoy from Halifax to Great Britain. Arnowitz is seen leaning against one of the gun barrels of a cannon that had been installed. 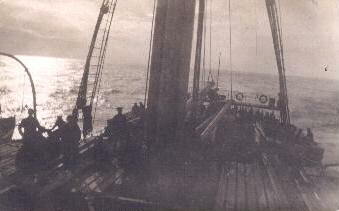 Snapshot taken by Heinrich (Henry) Ioganowitsch Arnowitz during 1917 on a convoy from Halifax to Great Britain.